The IBFES (International Board of Forensic Engineering Sciences) is an independent board that certifies professionals with a specialty in the forensic engineering sciences. An IBFES certification indicates that an individual has been determined by his or her peers to be technically competent, forensically experienced, dedicated to ethical work and professionally correct. Certification is only conferred upon individuals who meet the strict criteria established by the IBFES. The applicant's education, professional forensic experience, competence in technical matters and ethics issues, and general knowledge are all considered during a process of peer review, culminating in both written and oral examination. Applicants are additionally required to accept and agree to be bound by the IBFES Code of Ethics and Rules of Professional Conduct in their professional engineering science practice. Forensic engineering science professionals who become certified by the IBFES are awarded a Certificate of Qualification as a Diplomate, IBFES. They are then entitled to represent themselves as being Board Certified by the IBFES and to use the letter designation D-IBFES behind their name. Certifications are in effect for five years and all Diplomates of the IBFES must undergo a re-certification process every five years. Forensic engineering science professionals who become certified by the IBFES include those with degrees in the many traditional engineering disciplines such as mechanical, electrical, civil, industrial, and chemical engineering, etc., along with those in the engineering-related physical sciences including physics, chemistry, metallurgy, geology, meteorology, biomechanics, optics, and computer science, etc.. The IBFES has been accredited by the FSAB (Forensic Specialties Accreditation Board), an independent board which was sponsored by the NIJ (National Institute of Justice), the NFSTC (National Forensic Science Technology Center), and the AAFS (American Academy of Forensic Sciences), and is charged with developing and maintaining a process for accrediting organizations that certify individuals in the forensic specialties (see Links) . As part of that organizational hierarchy, the IBFES must continually demonstrate an adequate screening of the forensic engineering science professionals that it certifies and a discipline procedure to act on complaints. The IBFES was established to provide a means by which qualified and ethical forensic engineering scientists are identified, endorsed (certified) by their peers as ï¿½Diplomatesï¿½, and thereby recommended to the public internationally, and to the legal community in particular. The IBFES promotes the necessity of good ethics and through its Code of Ethics and Rules of Professional Conduct promotes among its Diplomates. Provision is made for sanctions in the event of proven violations. 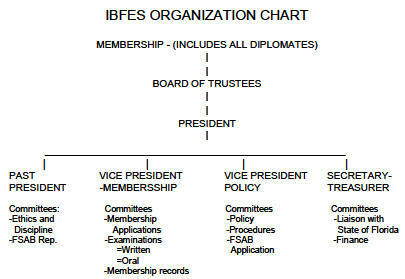 The IBFES The IBFES is organized and structured to accomplish the mission as stated above. In every identifiable way the process is designed to maintain proper security, correct technology, consistent legal aspects, appropriate qualifications and continuing evaluation. The IBFES is a non-profit corporation registered in the State of Florida. Download the IBFES Information Package here (PDF).